It has been an awesome week at Fort Jefferson. Our birdwatchers got an extra special treat while at the fortress. A Great White Heron joined us at Fort Jefferson and entertained the crowd immensely. Our birder group was fortunate to observe this magnificent white heron feed on some fish while wading through the shallow waters at the fort. With a striking motion, he captured his prey with his strong beak. What a sight! Another Great White Heron was spotted roosting on one leg in some mangrove trees. 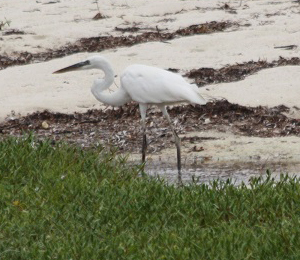 The Great White Heron is found only in the Florida Keys and is sometimes mistaken for the Great Egret, so, a second look is probably required of the all-white wading bird. Larger than the Great Egret, the Great White Heron also has a heavier bill and has yellowish or light-colored legs. This species of heron is also somewhat larger than the blue heron. The males usually weigh about 10 pounds and sport a wingspan of approximately 80 inches. They stand majestically measuring about 70 inches from the top of the head down to the tip of the claws. Its plumes are slightly shorter than the blue heron's, yet, its bill is larger. These two wild birds also favor different nesting habits, with the white herons preferring to inhabit and nest in areas comprising of mangroves. Their diet consists primarily of amphibians, fish, and crustaceans which are caught by silently stalking their prey. These rather shy and quiet white herons are extremely cautious of their surroundings and will quickly take off when startled, making loud croaking sounds as they flee from their perceived danger. They have been observed repeatedly circling a landing spot to ascertain the safety of an area. The cautious heron generally roosts in a different tree every night. Preferring to stay with its own bird type, the Great White Heron has a tendency to show an aggressive, and sometimes lethal, behavior towards other bird species, even towards the Great Blue Heron. But when the white heron does settle in to nest with its mate, both partners are equally dutiful in their nest-sitting responsibilities. After the eggs are laid, the young chicks begin to appear in about 30 days. While most of the white birds do not start life with the color white, the Great White Heron chicks are different starting out with a pale creamy white to white color from the second they hatch. Our birders thoroughly enjoyed visiting the very graceful Great White Herons this week. Watching how these beautiful birds take advantage of events for their own benefit makes one ponder that, just maybe, we humans could take a lesson or two from them that might help us in our personal flight through life.